Learn how your local Master Gardener program can help you! 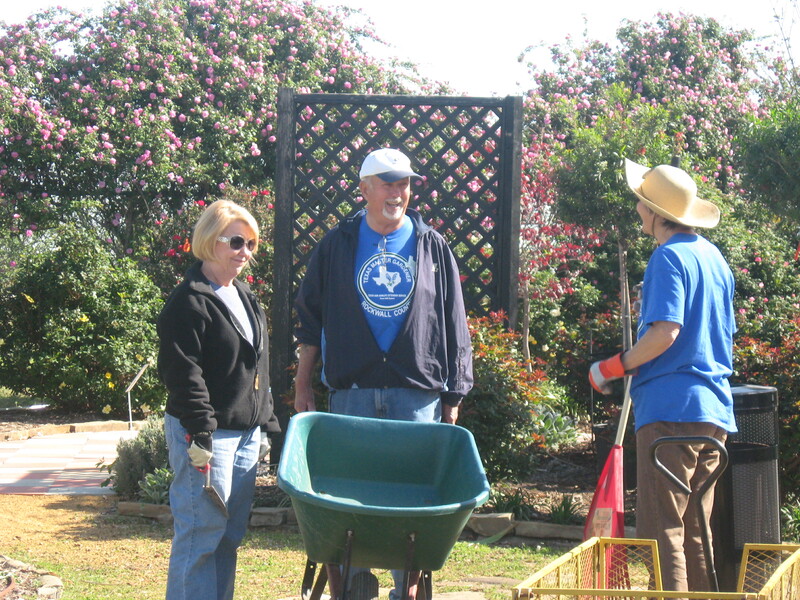 Rockwall County Master Gardeners at the Discovery Garden. I am a Master Gardener. I never knew those five little words would be so gratifying, but they are. I went through the 12 week Master Gardener certification training four years ago with Texas A&M AgriLife Extension. At the time, I didn’t really know much about the program, other than that it leads to one of the most respected honors in gardening. Today it seems as if I’m trying to get everyone I know on the master gardener bandwagon. It’s not that I get any sort of kickback for recruiting. I just really believe in the mission of the organization. So what is a master gardener exactly? And what does one do? Please excuse my enthusiasm, but I thought you would never ask! A master gardener is first and foremost a volunteer. In exchange for horticulture training, we agree to volunteer a certain number of hours for the Rockwall County Extension program. As an intern, I had one year to complete 72 hours of service. Believe me that was easy because there are so many events and activities. Once my internship was over, I now spend a minimum of twenty hours a year on extension-approved programs and opportunities. This includes everything from weed pulling at the Discovery Garden to working the information booth at the Downtown Rockwall Farmer’s Market. Master Gardeners must also dedicate a few hours to continuing education. I am required to get in at least six hours of horticulture education each year, an excellent way to stay on top of new and developing trends. In Rockwall County, a seventy-two hour training program takes place over 12 weeks from August to November. Currently the training program is only being offered in odd-numbered years. The next opportunity will be in 2017. A fee is required to cover the staff time, facilities and material needed. Trust me, extension offices aren’t trying to profit from these classes. And you’re likely to get some amazing resources you cannot buy anywhere. After the initial training, master gardeners are free to spend our volunteer and continuing education hours on almost any we want, as long as it’s extension-approved. Some gardeners spend hour after hour preparing and tending community gardens. Other volunteer opportunities include speaking to groups about gardening, harvesting veggies for the food bank and teaching garden classes. I know the master gardening program isn’t for everyone, but I think it is an impressive example of what can happen when a group of gardeners join forces. It is also a fabulous resource for the general public. For years we have been telling people to check with their local Extension office for gardening questions related to their area. Extension is designed to help serve the public. After all, these are your tax dollars at work. So don’t be afraid to check out the master gardener program in your area. As master gardeners, we’re taught that it’s not about having all the answers. It’s about knowing where to go to find these answers.